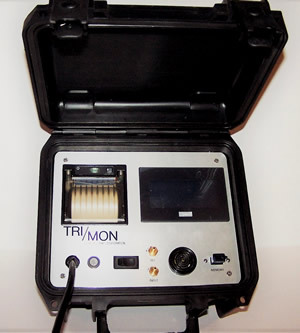 The Tri/Mon V.II by Micro Trap Corporation is an instrument for measuring and recording very small pressure differences. The unit was designed specifically for Trimon-V-IIpositive or negative pressure systems in hospitals, laboratories, clean rooms, HVAC systems and environmental work sites. It provides instantaneous readings of the differential between the air pressure inside a contained space and the pressure outside. Differential pressure is sensed by a capacitance type transducer with +/- 1% accuracy and is converted to an electrical signal for display by the LCD digital display panel with a resolution to 0.001 inch water gauge (0.249 Pa). 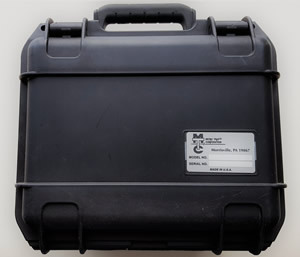 The pressure reading is simultaneously recorded on a flash drive and a printer if so equipped. The user can program the date and time, pressure alarm threshold limits and the time interval between readings on the touch sensitive color display module. There are just three screens which provide intuitive formats for setting these parameters. Internal full system check and zero setting on start up. Operating temperature 32 degrees f to 120 degrees f.